The Himachal Chief Minister Virbhadra Singh today ruled out the regularisation of encroachments on forest lands and said that the government would deal with the encroachers irrespective of the fact to “which area they belonged to”. Fear stalks the villagers of Bharnot and nearby areas of this district where a leopard has created a scare for the past four days. The leopard which tried in vain to harm two ladies on Sunday was again sighted during the night hours and took away a dog and a sheep. 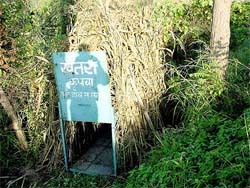 A cage which has been installed by the Department of Forests in the Khiah gram panchayat area of Hamirpur district to catch a man-eater leopard. The state unit of the BJP today demanded a White Paper on the recruitments made by the Congress in various departments. The Himachal Pradesh government today shifted six IPS officers, including four district police chiefs. The Superintendents of Police, Solan, Sirmour, Una and Hamirpur were among those affected by the reshuffle. SOLAN: Expresssing concern over the lack of trained manpower available for science reporting in the media, the Director of the National Council for Science Technology Communication, ministry of Science and Technology, Dr Manoj Patairiya, observed that this hampered daily breakthrough in this crucial field. He shared his views with The Tribune during his brief visit here. Besides rich cultural heritage and captivating scenic beauty, the entire Himalayan region of Himachal Pradesh has about 3,500 species of herbs and aromatic plants. As many as 70 endangered Himalayan herbs with rare medicinal properties are on the verge of extinction in the hilly tracts of Himachal. Anuradha Podwal stole the show with her bhajans and melodies during the first cultural evening of International Folk Dance Festival (Kulu Dasehra) at Lal Chand Prarthi Kala Kendra here today. A Russian cultural troupe sung a few Russian songs. Russian artistes also sung Hindi song “Ichak dana bichak dana...” which received a big applause. The Himachal Pradesh High Court today issued notice to the state government on the issue of encroachment on the forest land in Lahaul and Spiti area by the foreign nationals (Nepalese). A massive combing operation is going on in the forest near Jwalamukhi where four armed criminals are said to be hiding. The criminals were being chased by a police party of Hoshiarpur when they entered Himachal Pradesh. Two persons were killed and two injured when their car skidded off the road and fell into a ditch near Dohi village in the Jubbal area of this district yesterday, the police said. Talking to reporters here he blamed the former Chief Minister P.K. Dhumal for largescale encroachments on the government and forest lands and said that the policy to regularise the encroachments, prompted, induced and encouraged people to encroach large chunks of land overnight. He said that the number of encroachments which took place during the last months of the BJP rule, surpassed the land encroachments which took place during past 10 years. He said that the decision of the BJP government to regularise encroachments, especially on forest lands was an “anti-national” and “anti-environment conservation” act and there was no compensation for thousands and thousands of trees felled by the encroachers. He alleged that the former Chief Minister pressurised the police officers to fabricate and file the much publicised Katha allotment case against him and those officers who refused to succumb to pressure were victimised and refused promotions while the officers who obliged the political bosses was rewarded. He said that the senior officer of IPS cadre, who made the case against him joined the duty at Delhi without receiving any formal orders or relinquishing the charge. These elements, which also included a section of Congress men were out to damage him and tarnish his image for meeting their political ends, he alleged. He said that the posting of the said officer Diwakar Prasad as Director General of the SSB was against the spirit of federal structure of the Constitution and the government would take suitable legal action in this regard. Despite a bumper apple harvest this season in Himachal the procurement was going on smoothly and there was no shortage of boxes, trays and cartons or even trucks for transporting the fruit to the markets in the state and outside. The Chief Minister said this year the state was set to break the record of the last 10 years in the production of apples. So far, 1.83 crore apple boxes had been sent outside the hill state and by the end of this season, it was expected to touch 2.20 crore boxes, he said, while indicating that last season 1.24 crore boxes were sent outside the state. The government immediately imported 20 lakh trays from China so that the growers did not have to suffer, he said. He said that despite the blockade of roads due to landslides, the government took effective steps for transportation of the harvested fruit. He said the government had still had to pay a whopping Rs 13 crore to the apple growers for the last season under the Marketing Incentive Scheme (MIS) that the previous BJP government had introduced. The Himachal Pradesh Cabinet is likely to be expanded soon, Chief Minister Virbhadra Singh indicated at a press conference here today. The leopard injured Promila Devi of the Bharnot village during the daylight house on Friday. Villagers said their children preferred to remain indoors and didn’t go to school. People are not venturing out even for performing their daily chores. Meanwhile, the Department of Forests installed a cage between the villages of Khiah and Bharnot to capture the beast. Local people have demanded that the man-eater should be killed. A spokesman for the Department of Forests said the department was monitoring the situation and if need be trained marksmen would be summoned to shoot the beast. Addressing a press conference here, spokesman for the party Ganesh Dutt also urged the government to give details of the budget earmarked for the regular appointments and appointments to be made on a contract basis. He said there should be a transparent policy on appointment made on contract basis. He also alleged violation of employment rules in the recruitments. Mr Dutt demanded the high-level inquiry into the selection of candidates for JBT courses. The way the results of the pre-admission test of over one lakh candidates were declared within 10 days has raised many doubts, he added. He alleged interference of Congress legislators in the whole process. He questioned the speedy checking of papers within 10 days which he said was not possible. He also contested the Chief Minister’s announcement of a grant of Rs 30 lakh to St. Bedes College here on the occasion of its centenary celebrations when the state was in dire straits. Mr Dutt said most of the schools in the state were facing shortage of funds for various basic needs and the Chief Minister had given Rs 30 lakh to an institution which had crores at its disposal and where the wards of the affluent people studied. The Himachal Pradesh government today shifted six IPS officers, including four district police chiefs. The Superintendents of Police, Solan, Sirmour, Una and Himirpur were among those affected by the reshuffle. SP Solan, Shiv Ram Sharma has been posted as SP Sirmour in place of Shivpal Singh Verma, who has been posted as commandant first Indian Reserve Battalion at Bangarh (Una district) relieving SP Una of additional charge. SP Hamirpur, Abhishek Trivedi has been posted as SP Solan while SP Una Satwant Atwal and Ashok Sharma SP CID at Shimla have swapped places. Emphasising the fact that a scientific orientation was required for reporting on scientific issues, he said the technological aspect remained largely amiss in every news. While only a few newspapers had exclusive science correspondents, in all others science reporting was not accorded any special emphasis. The objective of scientific communication was to impart technological information to the people which can enable them to take informed decisions effecting their future, he averred. He lamented that lack of research and development undertaken in the indigenous media and felt that the foreign media was far better equipped to cater to the growing needs. Information flow was not only faster but also systematic unlike the domestic system which still needs development. The year 2004 would be observed as the “year of scientific awareness” where the national council for science and technology has been made the nodal agency. Traditional media in the form of puppet shows would be used to spread the message of health, hygiene and safety in the masses, he confided. A number of regions have been identified in the form of coastal, Himachal, Maru (Rajasthan) and central India. With radio remaining the popular media of communication in the rural India, special programmes will be telecast through Air he said. Programmes like Bharat Ki Chaap and Human Evolution, a 144-episode serial which continued for 13 years in 18 languages, were a great success, he said. Emphasising the need for inculcating an awareness in the masses about our biodiversity, he said this was the need of the hour. The impact of the WTO necessistated the need for everyone to know about our gene pool, safeguarding our intellectual property rights, patenting as well as our medicinal plants. There was a need to develop a software in the regional languages and even dialects about our research programmes so that information percolated to the grassroot level, he observed. Local scientific issues should be largely involved in the development of software. Suggesting inclusion of information of scientific communication in the syllabus of Himachal Pradesh University, he said emphasis should be given to the study of this subject in the state. A number of long and short-term courses run by other universities across the nation was drawing good response, he said. Besides rich cultural heritage and captivating scenic beauty, the entire Himalayan region of Himachal Pradesh has about 3,500 species of herbs and aromatic plants. As many as 70 endangered Himalayan herbs with rare medicinal properties are on the verge of extinction in the hilly tracts of Himachal. Though more than 10 endangered and rare herbs are being commercially exploited at various farms in the state, the state government has taken a tough stand to contain plundering, over-exploitation and smuggling of such Himalayan herbs and plants by empowering the gram panchayats to issue permits to the locals to collect and export the herbs. Moreover, it will be mandatory to seek recommendation of the local forest guard to secure permit in the case of rare species. The endangered minor forest species, which are in demand both in domestic and foreign markets, include salamjpanija, patish, karu, chora, dioscorea, revandchini, pushkarmool, bankakri, tejpatra, sonamakhi, mahmeda, ratanjot, taxus bacata and lalajira. However, among all minor species, taxus bacata is the most demanded endangered plant since its bark and leaves are used in the manufacturing of anti-cancer drugs. Rare herbs and aromatic plants having medicinal values are found in abundance in the higher reaches of Chamba, Kulu, Shimla and Sirmour district. But to earn fast a bulk, the locals of these districts while asserting their forest rights, plunder them and sell these plants in Mumbai, Delhi and Amritsar. While collecting herbs, they indulge in over exploitation, which eventually results into ‘ecological plunder’. Sociologists feel that poverty in the interior belts of these districts was the major cause that impels them to risk into vandalising the endangered herbal treasure available deep in the forests in the upper reaches. They suggest that instead of allowing them to exploit and export Himalayan herbs, they should be permitted to start commercial cultivation of such herbs under certain control of the government machinery. Significantly, to check the threat to the rich bio-diversity in the state, the state Forest Department in certain forest areas, that abound in such herbal assets, has stopped issuing licenses to the locals. Magsaysay awardee and prominent environmentalist Mr M.C. Mehta, who visited the town recently, suggested that gram panchayats should be given more powers to prevent plundering and exploitation of the medicinal forest wealth and technical guidance from the Dr Y.S. Parmar University of Horticulture and Forestry, Solan, should be provided to the villagers on a priority basis. A troupe from Gujarat presented folk dances. Besides local Himachali cultural programmes were presented by various cultural troupes. Earlier, Governor Vishnu Sadashiv Kokje inaugurated the festival. The Governor said fairs and festivals exhibited the rich cultural heritage of a country. He congratulated the people of the state for preserving its rich culture. While talking to mediapersons, Anuradha Podwal said she had travelled the world over but the audience so beautiful and peaceful in Kulu never came across. She lauded the works of late Gulshan Kumar. The Himachal Pradesh High Court today issued notice to the state government on the issue of encroachment on the forest land in Lahaul and Spiti area by the foreign nationals (Nepalese). The matter was brought to the notice of the court through a letter written to the Chief Justice by a travel agent Rajbir Singh, wherein he raised this issue and alleged that the slopes of Rohtang Pass in Lahaul and Spiti encroached on by Nepalese on a large scale from Gramphu to Khoksar in an area of 7 km. He further alleged that if encroachment went on like this in the greater western Himalayas, a day is not far when there would be huge landslides and the road connecting the border with China and Pakistan will keep on becoming inaccessible. Petitioner further alleged that the most alarming situation was that after four or five years there would be no birch trees left, because these encroachers nearly 300 in number meet their daily firewood needs from the adjoining reserve forest of birch trees at Gramphu. These types of activities are posing a big threat to the environment of the Himalayas. He further alleged that the matter had been brought to the notice of forest officials in Shimla but no action had been taken in this regard. While treating this letter as public interest litigation a Division Bench comprising Chief Justice V.K. Gupta and Mr Justice A.K. Goel directed the state government to file their reply within six weeks. The SSP, Hoshiarpur, informed the Kangra police which then tried to intercept the criminals near Jwalamukhi, but they were able to evade arrest after abandoning their vehicle. Its driver has been arrested. A large contingent of police from Punjab and Himachal Pradesh assisted jawans of the SSB at Jwalamukhi have now cordoned off the forest area to stop the criminals from escaping.